Fashion and beauty industries have quickly caught on to the trend that the younger generation is spending a significant amount of time on social media platforms, such as Instagram, Facebook, Twitter and YouTube, rather than traditional advertising platforms like TV. A 2017 survey by statistics portal Statista found that 84 percent of Koreans are active social media users. SEE ALSO : Virtual influencers : what about moral and legal issues? Another set of statistics showed that an average of 2 hours and 15 minutes per day is spent on social networks globally. As for Instagram, 90 percent of its users are younger than 35, and 68 percent are female, according to US social media marketing firm Dreamgrow. This has led to more brands turning to influencer marketing to lure consumers, further boosting the power of social media stars. “Influencer marketing has more focus on influential people rather than the target market as a whole. It identifies the individuals with influence, and orients marketing activities around these influencer,” Park Kyung-a, CEO of mobile marketing and advertising company Stella, told The Korea Herald. “Followers of these influencers are more than fans who like celebrities since they not only gain useful information from them but also empathize, communicate, and share common interests with influencers,” Park said. Paying celebrities to share branded content on social media is one of the most widely-known forms of influencer marketing. This kind of advertising, in which celebrities and popular Instagramers earn money by posting their experience with products, has developed globally in recent years on social media platforms. In the US, the social media influencer market was valued at US$1 billion (1.1 trillion won) in 2016, but is expected to reach US$2 billion by 2019, industry data showed. The US alone contributes to a whopping 85 percent of Instagram’s total advertisement revenue, according to data. The lucrative business is also significant in other countries. One of China’s best-known Wang Hong — a Chinese word for social media star — reportedly earns US$46 million a year. According to Forbes, top Chinese actress Fan Bingbing made about US$21 million in 2016. In Korea, over 2 trillion won was spent for advertising on mobile platforms last year, surpassing that of advertising on cable TV — 1.8 trillion won — for the first time. While Instagram influencers in the US charge up to US$100,000 for a sponsored post, industry insiders here say brands in Korea pay from 100,000 won to more than 2 million won for a single social media post, depending on the loyalty of the person’s followers. Beauty and fast fashion brands are at the forefront of using social media influencers who have millions of followers. South Korean cosmetics giant Amorepacific is one of them. Its budget cosmetics brand Etude House has seen success in influencer marketing, the company said. In February, it collaborated with beauty YouTuber Holy, who has some 382,000 subscribers, to promote a new cleansing water product. A video of Holy trying out the product garnered more than 630,000 views in just four days after its release. In a month, the video garnered over 3.8 million views, according to the company. “As these influencers try to review the product from a creative, new and different point of view, in ways that sometimes the company cannot think of, it is more appealing and more candid,” said Ahn Hyeon-jin, a public relations official at Amorepacific. “The rapid growth of influencer marketing shows how the ad industry is transforming as brands struggle to reach consumers in a widespread world of diverse content on the internet, which is now the biggest platform ahead of TV,” he added. Viral online posts have indeed raised revenue, according to Galleria Department store. In March, Galleria Department store collaborated with beauty influencer Sangahtube for the marketing of Tom Ford beauty products. Following the release of online content on Sangahtube’s social media channels, sales of Tom Ford beauty products on its online mall went up by 55 percent on-year, officials said. To make the most of influencer marketing, brands are testing ways to measure paid-partnership posts, industry insiders say. Although influencer marketing has many benefits in terms of brand awareness and winning over consumers, it can also go awry if an influencer loses public support. “To minimize the risks of influencer marketing, we determine the type of influencers the brand is engaging with before deciding on collaboration. While reach and engagement rates are great indicators in choosing influencers, the factors that define each influencer persona are found in influencer’s motivations and attitudes,” said Ahn from Amorepacific. Since there’s little that brands can do to predict whether an influencer will lose public support, brands are trying out new ways of creating sponsored content. 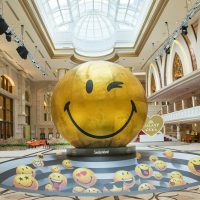 “Brands are finding their own approach to transparency and authenticity, whether or not the term ‘sponsored’ has a negative impact on consumer perception,” said an agency official who has planned several offline events with social media stars. “Since paid partnership does not always equate high sales or explosive consumer feedback, what’s important is that the brand matches with the right influencer for its product to sincerely deliver the brand’s value — or at least what the brand wants to say,” she added. Also Shinsegae, which opened its second city center duty-free store in Seoul at Express Bus Terminal in Gangnam on 18 July, has a dedicated area for social media users. The new five-story shopping space seeks to attract young and rich foreign tourists interested in Korean cosmetics and fashion. Thirty-six percent of the 13,570-square-meter space has been allotted to Korean brands. Inside the store, there is a space called Studio S where social media influencers can use microphones and lights for live broadcasting and filming. On the store’s launch day, Chinese online stars, often referred to as Wang Hongs, crowded the complex. The store is not without international luxury brands. It is the first duty-free store in the world to offer Manolo Blahnik and the first duty-free store in Korea to have Italian women’s shoes brand Sergio Rossi. A Shinsegae official said the store put emphasis on high-end shoes, accessories and watches. Other shops include Gucci, Saint Lauren, Chloe, Marc Jacobs, Kenzo and others. By September, some 350 shops will be housed in the Gangnam store. Chanel, Louis Vuitton and Hermes have not entered this store but Shinsegae is reportedly continuing to speak with the luxury brands. Each floor of Shinsegae’s Gangnam duty-free store is connected to the original Shinsegae Department Store, and there is a giant food court called Famille Station. It’s also close to JW Marriott Hotel Seoul. Shinsegae anticipates sales revenue of 500 billion won (US$441 million) for the first year of business. 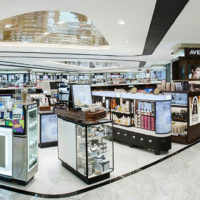 Its first in-city duty-free store in Myeong-dong annually records sales of 1.8 trillion won. Shingsegae DF Global is the third-largest duty-free operator in Korea, following Lotte and Shilla in terms of market share.